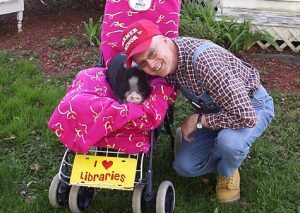 Daisy and Farmer Minor have performed “Pig Out on Reading” programs across the U.S. for over 14 years! As of 4/27/09, Daisy II has taken over as the “World’s Most Famous Pig”, already having been filmed for Belgian National TV and featured in newspapers and TV across the U.S.
Residing on their farm in Bristol, CT in the busy fall season, they travel much of the year. As one newspaper wrote in a two-page, seven color photo feature spread…. 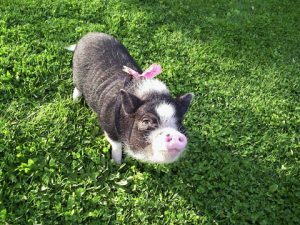 Daisy became the first pig ever invited inside the U.S. Capitol while on her 1st National Tour in 2002. Daisy had hundreds of Library cards from Libraries & Schools across the U.S. and Datu already has his own extensive collection. While the original Daisy was in newspapers around the world, TV news coast to coast and had been in Weekly Reader & Time For Kids , Daisy II already has 5 “Keys to Cities”, proclamations by Mayors and certificates of “thanks” from Schools and Libraries! Songs, poems and raps have been written for Daisy. Countless School Principals, Teachers, Librarians, Business Executives, Mayors, Celebrities and hundreds of thousands of school children have kissed the famous Pig! People kiss Daisy for a number of reasons ranging from promises kept to students for reading lots of books to fundraising efforts on behalf of non-profit groups, but mostly, just for the wonderful love of Daisy! We’ve done programs in all 48 contiguous states and have done 4 National Tours ! A 5th National Tour is in the planning stages for 2017. On Dec. 18, 2006 , Daisy made “Nationally Syndicated TV” as a featured guest on the Montel Williams Show in NYC, and was on the “Today Show” as well. Program is approximately an hour including kissing and petting. Most appropriate for ages 4-12. We are certified by USDA and insured.